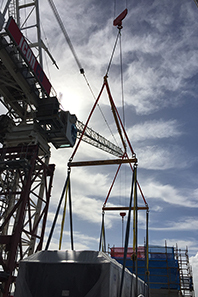 As Australia’s premier full-service tower crane & hoist company, we’re confident our fabrication and engineering services will exceed your expectations. Our expert engineering department takes an innovative, forward-thinking approach to design. We can customise equipment to your site specifications, while meeting Australian Standards and complying with manufacturers’ recommendations. We can provide an obligation-free quote. 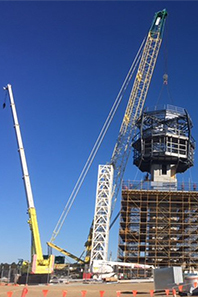 Our team of qualified, boilermakers specialise in fabricating just about anything for cranes, hoists and other lifting equipment. We have the facilities to then fabricate and proof-load the test to NATA Certification and ensure a flawless finish. Crane base design: We can custom-make crane bases and crane foundations for any job on any site. Choose from starter legs on a mass concrete footing or pile cap, static base, rock anchors, suspended grillage or travelling base. 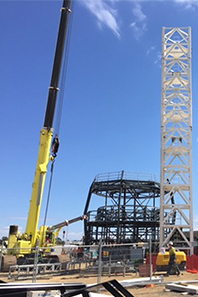 We can work with project engineers to incorporate crane bases into column footings, lift shafts and above/around existing services. Tie and climb design: Our team uses staging drawings to devise the best tie and climb options for your project. We also work with structural engineers to find the ideal fixing techniques. Hoist Design: Our in-house engineering team ensure that if you have a difficult job or location, we can design a solution to ensure the hoist works for you. Auxiliary equipment drawings and design: Need special equipment? Our fabrication department can design a range of auxiliary equipment for you – and then ensure it’s fully engineered and ready for use. Need a unique one-off project? We have a long history of engineering special solutions for our clients.